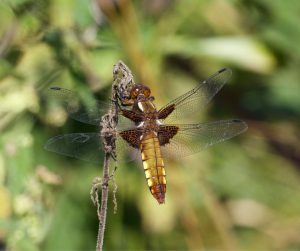 The total number of species recorded during the month was 98 which is well above the average for the previous ten years of 91.1 species. After no new additions to the year list in June or July, a total of 12 additions in August was most welcome. 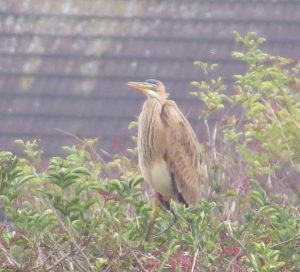 Whilst most were expected, we saved the best until last with the juvenile Purple Heron on 31st. Described by Andy Malone as “unbelievable” and, surely, it was not an obvious site for such a bird. However, any new bird will be something of a surprise after 28 years of watching. Also, welcome was the Little Stint on 2nd, our first for four years, and a Pied Flycatcher on 21st, after two years without one. A light cloud with a succession of showers visible offshore . Calm with a light NE wind developing. It seemed promising; perhaps we would get our first Redstart of the year or a second Pied Flycatcher. A juvenile Great Crested Grebe was on the sea, a Kingfisher was on the groynes at the eastern end of the beach and a Meadow Pipit,with Pied Wagtails on the promenade, would be a precursor of many more in the following months. 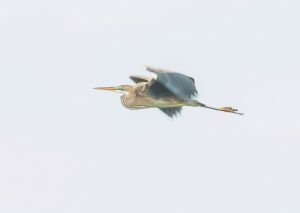 However, this did not prepare me for the sight of a Heron flying low towards the Marsh Pool whose overall warm brown colours proved it to be a juvenile Purple Heron. A brilliant new species for the site and, despite the usual scattering of people and dogs, it surprised us by landing on top of a large bush in the scrub. It remained there for about ten minutes and then glided down towards the brook where it was lost from sight. We couldn’t check all the brook without a risk of flushing the bird. As we hadn’t seen the bird in flight again Ted and I waited. Rob Stokes and Alex Perry and his father arrived and shortly afterwards the bird appeared, apparently having flown from the brook, and headed west by the Obs. Thanks to Alex for the excellent flight photo. Other birds included a Dunlin on the Marsh Pool, 10 Ruff (another new bird for the year) which flew west along the shoreline and an Arctic Skua flew east. A Sedge Warbler, two Lesser Whitethroats and four Whitethroats were in a small bush in the scrub, a Reed Warbler was along the east bank and two Yellow Wagtails flew west. Cloudy gave way to sunshine and a light northerly wind. A westerly movement was sporadic but included one Gannet, nine Wigeon and eight Teal, two Common Scoters, a summer plumage Grey Plover, a flock of 20 Knot, a flock of 12 Whimbrel and two singles, two Curlews and, best of all, two adult Arctic Skuas (light and dark phase) new for the year. A Green Sandpiper circled around the area looking to land in the brook. Also, a Great Spotted Woodpecker was on the spire of the church, three Yellow Wagtails flew west, there were two Lesser Whitethroats in the scrub and the Linnet flock had reached 25. Cloudy and calm. Waders included a Curlew flying west, three Greenshanks landing on the foreshore by the Obs briefly before flying on west, and three Redshanks on the beach. A Kingfisher was our first returning bird, later than usual but it was relief, after the “Beast from the East”, to have one on site again. 13 Swallows were gathered on TV aerials in the caravan park but there was no sign of any movement. A Spotted Flycatcher by the scout hut was probably a different bird to the Obs bird last seen three days previously. There were three Lesser Whitethroats, three Whitethroats and a Blackcap in the s crub or along the e ast bank. It was good to have Nicole Khan and Jason Moule pay a visit; they found a juvenile Cuckoo by Lang Court and also had a Hobby flying west. Waders noted were 23 Oystercatchers gathering on the incoming tide, 58 roosting Ringed Plovers (highest count of returning birds), one Dunlin, two Whimbrels on the beach which flew off west, a Redshank on the Marsh Pool and 85 roosting Turnstones. There were 12 Sandwich Terns offshore. 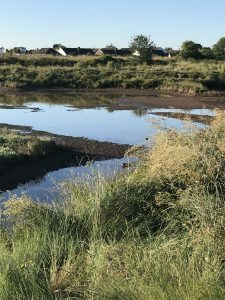 A Stock Dove landed on the beach, two Swifts were hawking over the estate, a Great Spotted Woodpecker was heard calling from the sewage works, Lesser Whitethroats were seen in the scrub and along the east bank and a Willow Warbler was at the Obs. 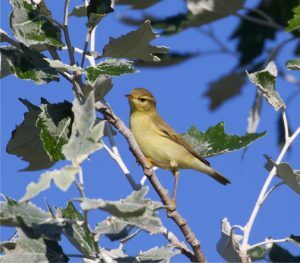 On this day: in 1990, a juvenile Golden Oriole was seen for much of the day in what was then an area of scrub but now forms part of the enlarged sewage works. Sunny with moderate WNW wind and cooler. Waders included an unusual flock of 55 Redshanks flying west (seen earlier at Reculver), three Sanderlings roosting with Ringed Plovers and four Dunlin and a Whimbrel on the beach. Our first Swift for nine days drifted south over the football pitch and a Sand Martin and two Yellow Wagtails flew west. 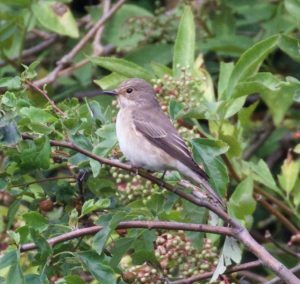 The Spotted Flycatcher was using the facilities at the Obs for the third day and a Willow Warbler was also there. The Spotted Flycatcher was still present. Cloudy with a light westerly wind. A Spotted Flycatcher along the east bank and later by the Obs, was the first of the year. Many Commic Terns were feeding distantly offshore but our first Black Tern of the year flew west close inshore. Seven Teal and two Curlews also flew west. A Wheatear was on the shingle ridge and a Reed Warbler and Willow Warbler were along the east bank. Cloudy with a light westerly wind. 13 Little Egrets were gathered in the remnant brook at first light. 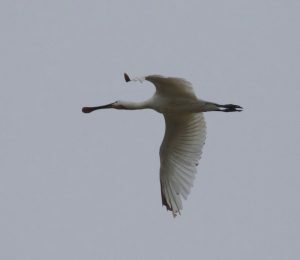 A juvenile Spoonbill flew west at 7.45 am (our second this year) and was probably the one that had been present at Grove Ferry earlier in the morning. 10 Teal, a party of six Greenshanks and seven Curlews flew west. Common Terns were flying west, in groups up to 20, one group included an Arctic Tern. 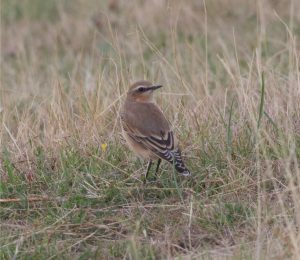 There were two Wheatears were on the shingle ridge, a Lesser Whitethroat was in the scrub and a Willow Warbler was at the Obs. A Clouded Yellow that wizzed by the Obs was our 22nd butterfly species of the year. A Pied Flycatcher, seen briefly along the upper brook, was our first for three years. Found by Andy but, unfortunately, not seen by those who looked for it later. Also, three Lapwings flew west (the first this month) and a Wheatear and two Lesser Whitethroats were also seen. 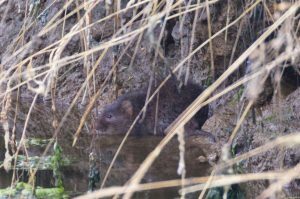 It was good to see a Water Vole for only the second time this year. This species has hung in along the Swalecliffe brook because of the absence of mink (never seen here) but still has to cope with dog owners who allow their dogs to hunt the brook. 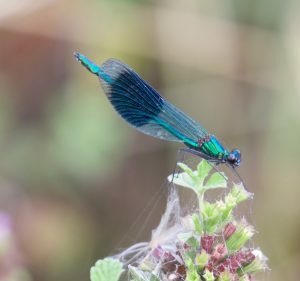 A Banded Demoiselle dragonfly was only the fourth record for this site. Cloudy and calm. Not so active today. Seven Dunlin flew west along the beach and another was roosting with Ringed Plovers and Turnstones. Seven Yellow Wagtails flew west, there were two Wheatears on the beach, a Reed Warbler near the Marsh Pool and four Willow Warblers along the east bank. Sunny with a light westerly wind. More activity today. 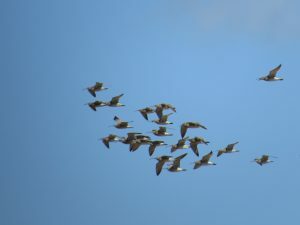 A flock of eight Canada Geese, which came in over the sea, flew east and then back west, was unusual for August. Groups of seven, nine and two Teal flew west, two Common Scoters flew east and a juvenile Marsh Harrier flew west. A single summer plumage Grey Plover, our first of the autumn, and a party of nine Black-tailed Godwits flew west. Roosting waders included 43 Ringed Plovers, four Sanderlings and 114 Turnstones. Also, a Great Spotted Woodpecker, landing in the trees at the back of the sewage works, was chased off by a Magpie and two Yellow Wagtails flew west. Sunny periods and a moderate SW wind. A Great Crested Grebe and a female Marsh Harrier flew west over the sea and a Hobby flew west low over the grassland and a Peregrine was also seen. There were seven Sandwich Terns offshore ans 10 Swifts and a Sand Martin flew west. 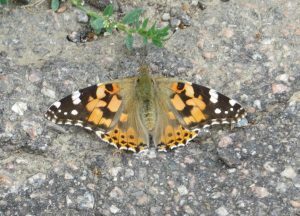 A Painted Lady was near the scout hut buddleia bush. Details of the four Pitsea landfill site Herring Gulls, that were on the beach on 31st July, have been received. None has been recorded out of Kent since they were rung (between 2013 and 2017). All have been seen in the Thames Estuary-North Kent coast area although one has ventured as far as Dungeness. A Reed Warbler and a Reed Bunting in the scrub were both first returning birds and a Willow Warbler was also seen. Five Gannets and 32 Gannets were offshore. Sunny with a moderate westerly wind. Three Gannets and three Whimbrel flew west and two Dunlin were seen in flight over the beach. Our first Whinchat of the year was in the scrub although it proved difficult to relocate. Three Swallows flew west, one Yellow Wagtail flew west and one or two were seen around the Marsh Pool. A Grey Wagtail was in the brook by the sewage works entrance, a Willow Warbler was heard calling near the Obs and a Jay flew along the east bank and into the Wood. An adult Great Black-backed Gull on the beach was carrying the colour-ring 34G. An old friend, having been seen here in 2014 and 2016. 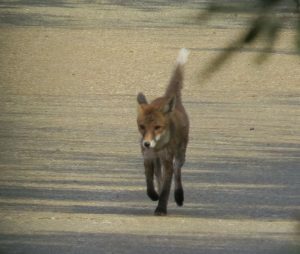 He was rung as a chick in Brittany in 2010 and has also been seen at Whitstable, at Dungeness and twice more back in France. Sunny with a light westerly wind. A female Tufted Duck flew east at 6.20 am. Later, three Shovelers flew west. Two Whimbrel flew west and, on the Marsh Pool now with some water, a Common Sandpiper and Redshank were seen. Two Stock Doves flew south over the football pitch, a Garden Warbler was along the east bank and a Willow Warbler at the Obs. An evening visit by Andy produced our first returning Wheatear and Snipe. 30 Swifts flew west and a Kestrel was the first seen here for some time. Sunny and fairly calm. Warblers were more in evidence this morning; our first Garden Warbler of the year was seen along the east bank; our first Sedge Warbler of the autumn was in the scrub, there were several Willow Warblers in the scrub and along the east bank and the “resident”warblers, Whitethroat, Blackcap and Chiffchaff were also more showy. Even Robins showed more! A flock of six Whimbrels flew west and a Common Sandpiper was seen on the beach and in the brook. As the tide rose, waders gathered to roost on the beach between the groynes; 84 Turnstones, 37 Ringed Plovers and four Sanderlings were also the highest counts so far this autumn. A juvenile Moorhen was in the brook and Green and Great Spotted Woodpeckers were calling within the sewage works. 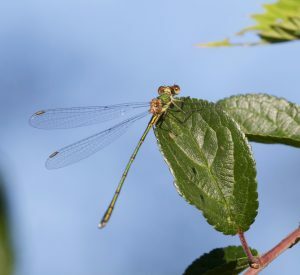 Swalecliffe is not known for odonata. 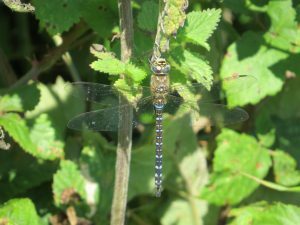 So, our second ever Willow Emerald, our first Broad-bodied Chaser and a Migrant Hawker represented a good result. A Brimstone moth was also seen by the Obs. Cloudy with a light northerly wind. Wader numbers continue to increase with 34 Ringed Plovers roosting on the shingle ridge and 68 Turnstones roosting between the groynes at the eastern end of the beach. There was also a pristine breeding plumage Sanderling,complete with rufous face and breast (I believe they are called Red-necked Stints on Fair Isle). Other waders included single Redshank and Common Sandpiper. One Swallow and one Yellow Wagtail flew west and one Grey Wagtail was in the brook by the sluice. Sunny with a light to moderate NW wind and cooler. A juvenile Arctic Tern, seen close inshore by the Obs, was a new species for the year and there were more Sandwich Terns offshore and ten Common Terns flew east. An early Pintail flew west and a juvenile Marsh Harrier, flying west low over the sea, was our first of this species since April. Waders included 28 Ringed Plovers on the beach on the incoming tide, two Common Sandpipers and, late in the morning, a flock of 28 Whimbrel rested briefly on the beach. Also, five Sand Martins flew west and a Willow Warbler was along the east bank. An “white” Swallow was perhaps the highlight of Andy’ visit. 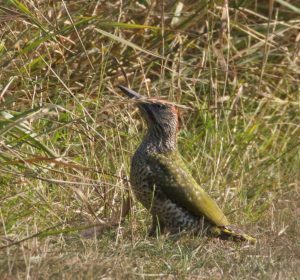 There was also one drake Common Scoter which flew east close inshore and a juvenile Green Woodpecker on the football pitch. Arnie van Orsouw noted three Grey Wagtails present in the afternoon. Sunny, warm but with an onshore breeze. Two Great Crested Grebes flying west were the first noted here since May. An adult Sanderling was the first of the autumn and other waders numbers increased with 18 Ringed Plovers and 60 Turnstones roosting at high tide. A flock of eight Whimbrel flew west and a calling Green Sandpiper flew south unseen. A flock of c190 Herring Gulls on the beach included 113 juveniles. Two Sandwich Terns included a juvenile bird. Three Little Egrets were roosting along the east bank at high tide and later were feeding on the beach. Sunny with a light NE wind and still very warm. Two Gannets and three Sandwich Terns were offshore. Waders included 12 Ringed Plovers, an increase to 33 Turnstones and an adult Dunlin (our first returning bird) roosting between the groynes at the e astern end of the beach, six Whimbrel west and a Common Sandpiper. A Stock Dove flew west over the beach, a Meadow Pipit was in the grassland, a Grey Wagtail was in the middle brook and two very vocal Lesser Whitethroats were in the scrub. Sunny with a light NE wind. Another very hot day with clear skies did not seem promising. However, when I arrived Andy had already seen a flock of 80 Knot flying west. As I was counting the Ringed Plovers (13 in total), I spotted an adult Little Stint feeding amongst them. This was our first for four years and only our third in the last ten. So that was two year ticks already. However, it did not carry on it quite the same vein. Other waders included two Redshanks, a Common Sandpiper and 13 Turnstones. Frustratingly, two more flocks of tightly-grouped waders (perhaps 200 in all) flew west too far out to positively identify. Other birds noted were eight Little Egrets, four Mediterranean Gulls, including three juveniles on the beach, a Stock Dove flying south over the Obs, a Great Spotted Woodpecker in the sewage works that later flew south over the churchyard, two Sand Martins flying west, a Lesser Whitethroat in the scrub and a Grey Wagtail. sunny with an onshore breeze and very warm. A slow start to the month. Waders noted included three Ringed Plovers, two Redshanks and seven Turnstones but the falling tide may not have facilitated an optimum count. All three (as far as we know) broods of Mallard were on show; one brood of seven in flight and two broods of five are fully-grown. The juvenile Sandwich Tern was seen again. 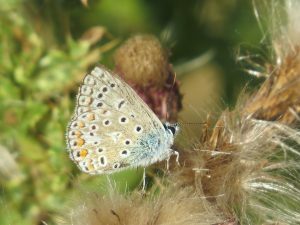 A total of eight species of butterfly to start the month including a Green-veined White, Comma, Small Heath and Holly Blue.